The perimeter of any business or home is its greatest opportunity arena and its weakest point. 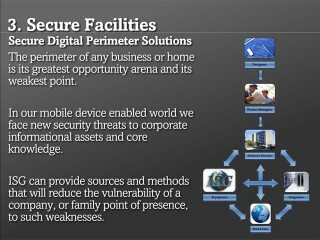 In our mobile device enabled world we face new security threats to corporate informational assets and core knowledge. ISG can provide sources and methods that will reduce the vulnerability of a company, or family point of presence, to such weaknesses. Call ISG at 1-310-729-1505 or use our contact page to send an email.